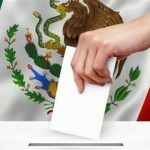 Ignoring the 19% of Mexicans with no preference between the three presidential candidates facing off on 7/1/18, leftist populist Andres Manuel Lopez Obrador (AMLO) of MORENO, leads comfortably with 48% of the vote, Ricardo Anaya of PAN follows at 26%, with Jose Antonio Meade of PRI at 18%. AMLO vows to put Trump “in his place” and his victory will usher in testier US-Mexican relations. Not good for NAFTA prospects.